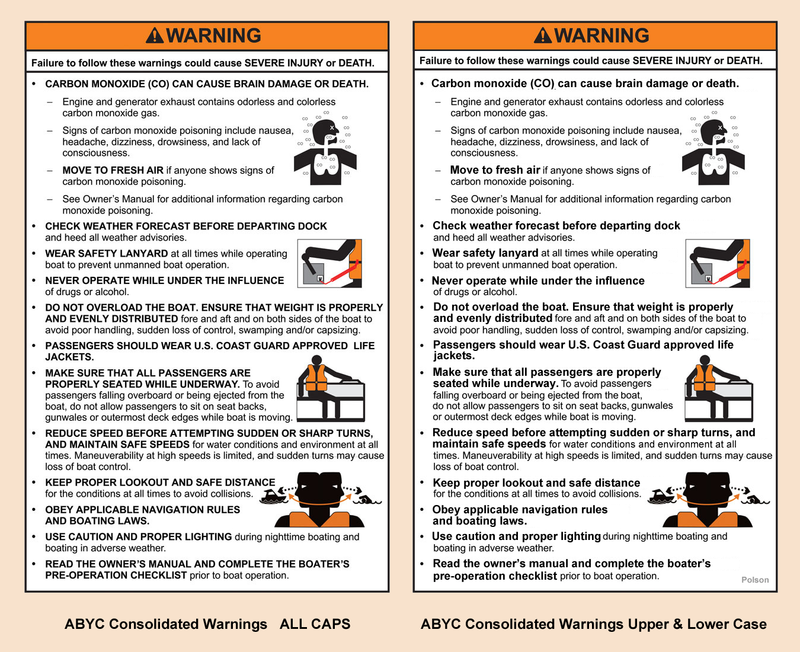 We previously announced the American Boat and Yacht Council (ABYC) consolidated boat warnings in our May 2015 post titled, ABYC Releases Consolidated Boat Warning Labels. As we review those labels, one feature of several labels stands out, the excessive use of ALL CAPS. As ABYC talks about the new labels, they repeatedly mention American National Standard Institute (ANSI) Z535.4 standard for product safety signs and labels. We have not seen ABYC specifically say the new consolidated labels are in compliance with ANSI Z535.4. However, ABYC mentions ANSI Z535.4 frequently enough we anticipate many will think the new ABYC warnings are ANSI Z535.4 compliant. ANSI Z535.4 says the preferred format is to use mixed upper and lower case letters. They go on to say the preferred format is to only capitalize the first letter in the first word in a sentence. ANSI Z535.4 goes on to say the use of ALL CAPS for the word message is discouraged because it is harder to read quickly than lower case type. ANSI Z535.4 does say a single word or phrase may be emphasized by the use of ALL CAPS on occasion. Basically, extended use of ALL CAPS makes the warning harder to read. When most people read ALL CAPS THEY MUST READ ONE WORD AT A TIME (like you just did). The use of upper and lower case letters is more inviting and can be read more quickly. Boaters are more likely to read the upper and lower case warnings than ALL CAPS warnings, especially when the warnings are lengthy like the gas outboard consolidated helm warning. 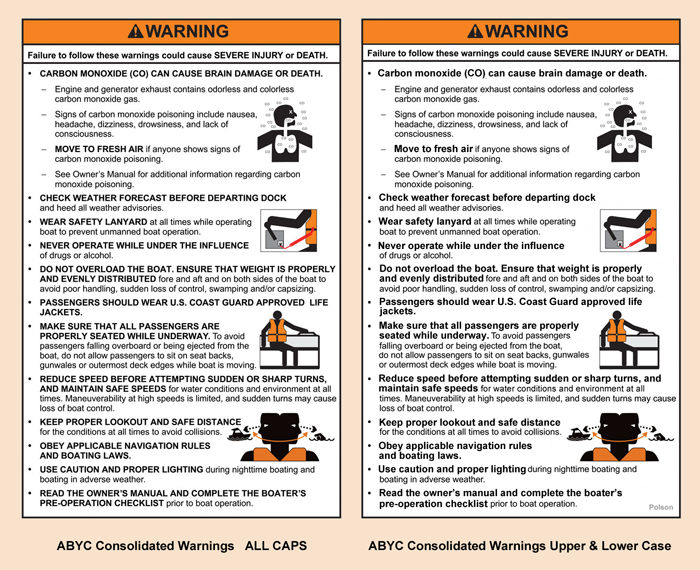 Below we compare the existing ABYC consolidated helm warning for gasoline powered outboard boats on the left with an upper and lower case version of the same warning. Click on the image below to see a much larger image to compare them side by side. The example of the helm label above is but one of several. Most of the new consolidated warnings extensively use ALL CAPS. We strongly suggest ABYC reduce the use of ALL CAPS in their consolidated boat warnings. We all know the real intent of manufacturer’s warnings is somewhere on a sliding scale between trying to prevent accidents and trying to protect themselves in court (many would insert CYA here). We hope boat builders have not slid the scale over so far they make the warning harder to read at the expense of thinking bolded ALL CAPS would be easier to defend in court (look, the injured party did not obey our warning and we even had it in bold type in ALL CAPS). We encourage the industry to do the right thing and at least consider reducing the use of ALL CAPS text on the consolidated warnings. We are currently in process of reviewing the new consolidated warnings and will be posting an extensive review. While we anticipate most of our ideas will not be incorporated by ABYC, we think this one (reducing the use of ALL CAPS text) has a chance of being accepted. This post is one of several of on the ABYC Consolidated Warnings. Links to all the posts are supplied below.